For years, Villicana Winery winemaker Alex Villicana saw a portion of his premium Paso Robles red wine swirl down the drain. It was almost unbearable to watch—not unlike the shower scene in Hitchcock’s Psycho. Winemakers routinely “bleed” a percentage of free-run juice from their red wine grapes prior to processing. That part isn’t unusual. But Villicana is a problem solver and a firm believer in the fine art of upcycling. Perhaps, even, to a fault. In the midst of hectic harvest season, the winemaker would struggle to find time to preserve the precious pink-colored runoff for use in jellies and jams. Like a leaky facet, the lost juice haunted his soul. 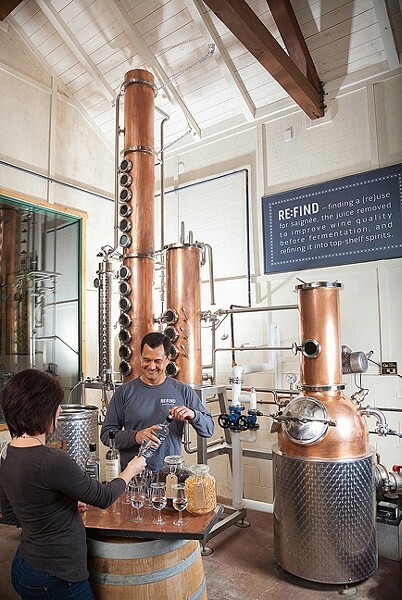 SPIRITED AWAY: Pictured, the distillery at Re:Find in Paso Robles. Eight Paso Robles craft distilleries will shake up wine country with a mix of locally crafted artisinal booze, eats, and music at the Paso Robles Inn Ballroom this Feb. 27. The clouds parted and angels sang. In 2009, the winemaker and his wife, Monica, started on the path to creating Re:Find Handcrafted Spirits, now known as the darling of the burgeoning Paso Robles craft spirit industry. A hint of sweetness and luxurious mouthfeel round out Re:Find’s vodka. The distillery’s gin is equally impressive, imbued with juniper berry, coriander, orris root, lemon and orange peel, grains of paradise, and lavender. Both spirits benefit from a regional advantage: high quality grape juice base. Think about it: Most distilleries use potatoes or grain to make their hooch because these items are cheap, not delicious. When life hands you pure Paso Robles grape juice, why not make killer booze? That’s the question so many Paso Robles winemakers have been asking themselves these days. The newly formed Paso Robles Distillery Trail contains eight distinct distillery operations, each unique in their offerings (brandy, grappa, rye whiskey, and even Italian Nocino walnut liqueur, to name a few). Now, the Distillers of SLO County trade nonprofit association, headed by Villicana, is gearing up for its first public event—and yes, you can bet this one will sell out quicker than you can say “straight up.” Villicana likens this event to the first-ever Paso Robles Wine Festival. At the time, no one knew how big the wine industry would get, but there was something in the air. It was electric. Dubbed Fire and Ice, the swank shindig is slated for Feb. 27 at the Paso Robles Inn Grand Ballroom and will feature all eight Paso Distillery Trail distilleries’ products served alongside a feast of munchies. We’re talking tri-tip sliders, carnitas street tacos, barbecue pork grilled cheese sandos, and twice-baked red potatoes. Not a great night to start that New Year diet. Sample golden (fiery) and clear (icy) libations crafted by Bethel Rd. Distillery, KROBAR Craft Distillery, Azeo Distillery, Opolo Distillery, Pendray’s Distillery, Re:Find Distillery, Red Soles Stillhouse, and Wine Shine Distillery. As you can imagine, there will be some peacocking among the bartenders (aka the distillers). FIRST ROUND: Alex Villicana of Re:Find and his fellow distillers are excited to share the first wave of Paso Robles craft spirits with a thirsty public Feb. 27. “We have all been working together to get to the same end, but at the same time, we have this friendly competition trying to outdo each other to find out who can make the better cocktail. It’s the fun of the competition,” Villicana said. It should be quite a show, what with the dance of cocktail shakers and clinking of ice. Ryan Horn and David Vondrasek of Azeo Distillery are taking the “competition” one step further. Instead of crafting a creative cocktail, the duo plans to wow attendees with a show-stopping product on the rocks: their premium, Paso-made apple vodka. 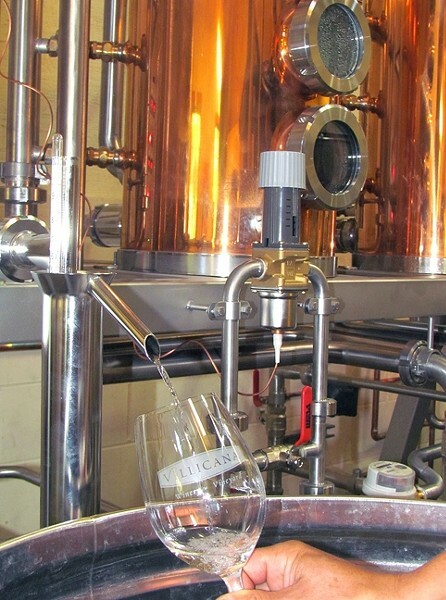 The distillery name is actually short for the term “azeotropic distillation,” known to produce a cleaner flavor in spirits. According to the guys, its completely neutral in flavor—far from the flavored vodkas you’ve stomached in the past. Their brandy, much like a French eau de vie, offers up just a whisper of apple allure. Vondrasek, a home winemaker, is the eager workhorse of the operation, spending long nights researching and experimenting. The pair met through Horn’s custom crush and bottling business, Vino Veritas in Paso Robles. It is there, in a corner of the industrial space, that the pair’s apple base bubbles in a glimmering copper still. Apple rum fermented with molasses is also on the roster. DRINK UP! : Can’t you hear the ice clinking now? Discover the Paso Robles Distillery Trail this Feb. 27 at Fire and Ice. The inaugural event kicks off at 4:30 p.m. With food, locally produced distilled spirits, and music by Bear Market Riot. For tickets and information, go to pasoroblesdistillerytrail.com. Horn cut his teeth as assistant winemaker at JUSTIN Winery and now produces two small labels, Nacimento Cellars and Wasted Youth. It’s a fair assessment to say that he’s got quite a bit of experience under his belt in terms of production and equipment. Paired with Vondrasek’s scientific mind, Azeo may just be the next craft distillery to watch for. Want to try it first? Fire and Ice is your destination. As Vondrasek so aptly pointed out, you can’t imagine something awful going into a still and coming out tasting good. This, at its heart, is the reason why Paso Robles is killing it at the craft spirits game. Put good in, get good out. I think that’s pretty good advice for making spirits—and forging new friendships, for that matter. If you do it just right, you’ll end up surrounded by plenty of both. Hayley Thomas loves the sound of a vintage cocktail shaker doing its thing. She can be reached at hthomas@newtimesslo.com.